The River Tees is located in the north of England. It flows east from its source in the Pennines to its mouth, on the North Sea coast. The source of the River Tees is Cross Fell in the Pennines. 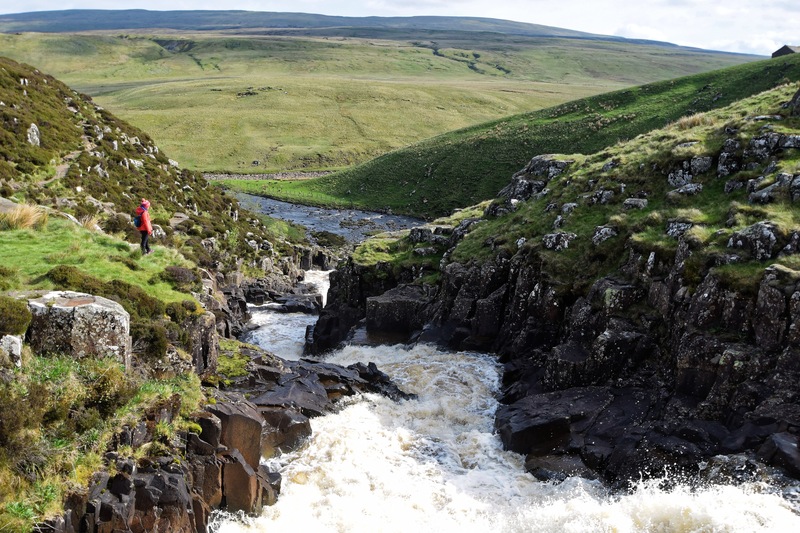 In its upper course, the River Tees flows over hard, impermeable rocks. Vertical erosion has formed classic V-shaped valleys. The image below shows interlocking spurs close to Cauldron Snout. Interlocking spurs close to Cauldron Snout on the River Tees. The UK’s largest waterfall, High Force, is located in the upper course of the River Tees. An area of hard rock, called Whin Sill (or Whinstone), is located above a layer of soft rocks (sandstone and shale) and together they create the waterfall. High Force waterfall on the River Tees. As the River Tees reaches its middle course lateral erosion overtakes vertical erosion and is evidenced by winding meanders. Meanders in the lower course are much larger. Oxbow lakes have formed in some areas. Evidence of past flooding can be seen in the natural levees that have formed. In the lower course, The River Tees has a large estuary with mudflats and sandbanks.